The PhilVenSol sends its solidarity to President Nicolas Maduro and the Venezuelan people who are resisting the attempts of the opposition forces to oust Maduro and his government by possible violent protests. 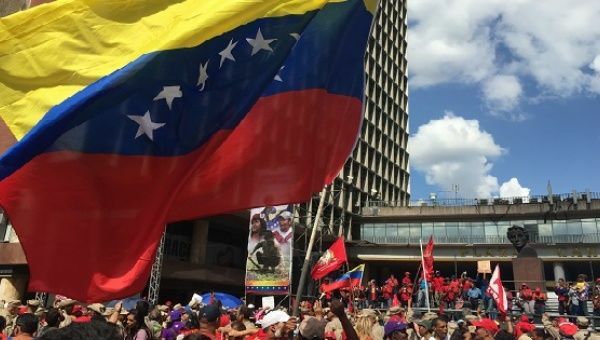 The opposition forces have called for the “taking of Caracas” to push for the ouster of the president. Many believe that this is a start of a wave of violent protests similar to what the opposition had done in 2014 at the beginning of the Maduro government. The opposition leaders are also calling for mass demonstrations and “civil disobedience” to insist that a referendum for a new government takes place this year. If the referendum pushes through, an early election for a new president of Venezuela will take place soon. The capitalist media and various capitalist governments, headed by the United States, are promoting the event internationally as the end of the Maduro government and the socialist government in Venezuela. The capitalist media and the opposition forces have been using the food problem in Venezuela to attack the socialist experiments undertaken by the Chavez government and carried forward by the Maduro administration. The food scarcity itself is a suspect, as it affects only the basic commodities that are mostly controlled by big Venezuelan and foreign companies. One such company is Polar Corporation, which is responsible for 62% of the market for pre-cooked corn flour used for the Venezuelan staple food, arepas. Non-biased media reports have stated that while there are shortages of particular essential items, others are in abundance. If one leaves the supermarket and deals with the black market, the essential items can easily be bought at very steep prices that the poor cannot afford. This is clearly a case of hoarding of essential items at regular markets. The capitalist media have been harping on the lack of concern of the Maduro government to the food problem. We, however, applaud the efforts of the Maduro government and especially the community organisations which are undertaking a few projects to ease the food crisis at the grassroots level. A key mechanism has been the communes, grassroots citizen-led social institutions which are now venturing into local food production and processing and are doing house-to-house distribution of basic food items at cheaper prices. Defend the gains of the revolutions!